Cup Cake Pop, the latest matching game with a Bakery twist! 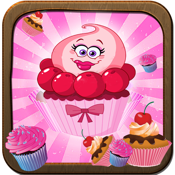 Cup Cake Pop is a fantastic connect three game where you need to join three types of the same Cup Cake to earn points and progress further and further. Massive Cup Cake powers will have you exploding cup cakes all over the place!